The ScreenFlow team is interested in hearing your feedback on the Chroma Key feature. Do you find Chroma Key useful? Is there anything about the feature that you would improve/change? It is useful, but honestly, it is not very good compared to Premiere, OBS, and other tools. Please make it better. The green screen has to be so perfectly lit to work well. I like the ability to insert yourself into what you are presenting and find the feature extremely helpful. I love the idea but often find it hard to get to work in practice. I also have miserable lighting and am only using the camera on an older iMac, so there may be confounding issues. I use it in virtually every training video I make. It's a crucial tool. I'd love to see it get better, but I've no idea of the technological challenges for doing that. But yes, a powerful tool. Michael Glasser I've found the key is to video me on my iPhone and then add that into the presentation. Not sure what the resolution is on each iPhone but it's a lot better than my Mac! I am sure some of the issues I have are my camera (I use my iMac's) and the fairly lousy lighting in my office (though I have improved that with not much success, it is also a tiny office and I have no good way to have a sheet hang without wrinkles). I do not have an iPhone but have an iPod. Might try that... thanks. It is ok... not good as mentioned and I’ll be glad to see some improvement. For example, I can still see the cast of the hidden background if I use this feature over a clean background. (see the screenshot) It may look thin on ScreenFlow but once processed by Youtube it is super visible and look bad. Agree with Bernard. It's a powerful feature in Screenflow, one I use in virtually all my videos, and I would love to see it improved. I find the Chroma Key in Screen flow very challenging and regardless of how the greenscreen is lit or the subject id lit you never get a professional looking video outcome. However, when there is a critical video, I import the green screen video into Wirecast and add a layered image behind it and get a great outcome. The Wirecast Chroma Key is much superior. The Wirecast Chroma Key is much superior. If Chroma Key is a feature in Screenflow and Telestream has the knowledge to make it work properly (like in Wirecast) then they should invest time to make it right in Screenfow. Chroma Key is a very helpful tool but really needs to be improved. One issue I see many users have, especially when using low bit depth cameras such as their built in FaceTime Cameras, is not color grading the shot first. This makes a big difference. Seems like there is room for 2 tools in the product (Quick Key, and Advanced Key). For a quick key tool, I'd love to see the feature work like the Instant Alpha tool in Keynote. Its super easy to select, and add to selections in order to pull a great key with Instant Alpha. Basically works like magic. For Advanced Key, More options for selecting color ranges, edge detection, layers of key selection, shape masks to limit the effect to specific regions, luminance range selectors, selectable key views (what's keyed, what's not, etc. ), Grow/Shrink, whole fill, Mask Paint (would be an awesome feature), and Video Scopes. Video scopes would be crazy helpful in pulling better keys, so we have the data to make the key look right and help take the guesswork out of the tools. Insanely useful, however, I need to be able to fully skew the image eg. using chromakey to play another video inside a tv I need to be able to fit the image/video into the TV screen to make look plausible. Bo Astrup Something like corner pinning? CraigS I guess that what you would call it. Bo Astrup Warp and corner pinning are different. Sometimes they are used together if the surface is not flat though. The more solid your background color is in your video clip, the better the end result. Bernard Sfez (yeah answering myself). More seriously, other control than Chroma Key can change the way it behave. After more testing, I found out that only changing the colour control => Contrast change the way Chroma Key behave (in a bad way). It is super useful, but I would like to see some tools for color correction and if possible, also for color grading, to make your chroma keyed videos look more natural. I am mostly using two lightboxes for lighting, and that creates a certain lighting look which would be great to deal with if we had some default color grading choices. Please explain what tools specifically. I came here today just to figure out what's wrong with the Chromakey in Screenflow. I like to use Chromakey in every video I do, but when I apply the filter, it's never right so I try to compensate by using the color selector. No matter what I do, it will only let me click in, select and apply a color ONCE in the selector. After that, the only way to refine it is to remove the Chromakey filter and reapply it. Then I get another shot. It can take me 20 times to get it right. Truly frustrating. 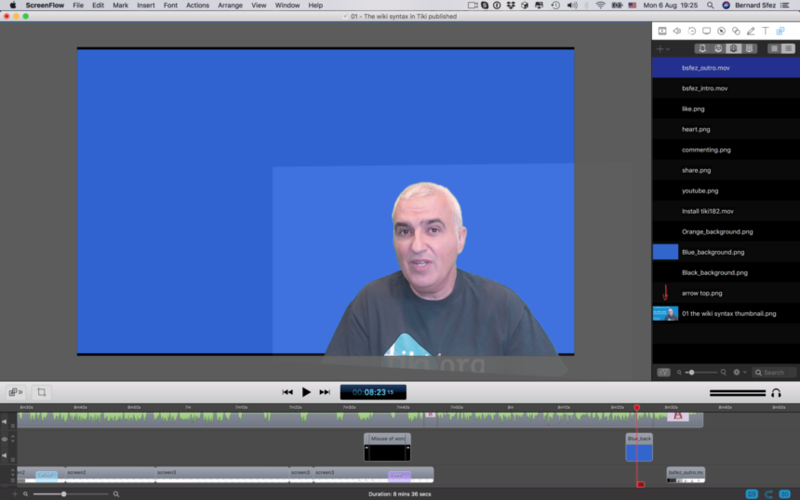 Just purchased wc11 and was disappointed with chromakey as I was using wc6 and placing words from propresenter over video with ck with desktop presenters. Current version would not allow key out of black background... this would be a great option..